Modern States Education Alliance is a non-profit organization whose goal is to offer quality college education online to any motivated person who wants it. Their website was launched in 2017, and the mission of the organization is founded on the accessibility of affordable education that respects individuals. Steve Klinsky, a philanthropist businessman, created and financed Modern States. The organization has expanded by joining forces with other foundations and educational leaders. For example, the organization offers teaching association with edX, the online learning platform created by Harvard and MIT. Some university systems such as those in New York, Texas, Ohio, Indiana, and Tennessee are affiliated with Modern States Education Alliance. And everywhere in the world, other universities grant credits according to the results obtained in the exams which are part of the courses offered through Modern States Education Alliance. The idea is so simple. With a few clicks, you can begin one course or several. The platform currently offers about 60 courses, corresponding to the first-year university level. They are given by reputable universities and professors and include online conferences, questionnaire games, and tests. 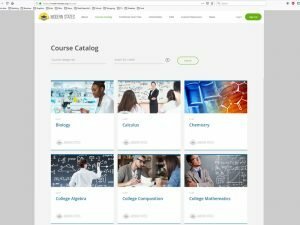 For example, students can choose courses in: history, computer technology, math, chemistry, English, economics, programming, physics, psychology, German, or Italian. Some of these courses prepare them for the College Level Exam Program (CLEP), and others for Advanced Placement (AP). Satisfactory results in one of these two tests allow students to obtain university credits in more than 2900 universities in the world, according to the American College Board. Ava, a student of Modern States, confirms that for all the CLEP exams she passed, beginning with the first essay, she obtained university credits. According to Modern States, it is possible to accumulate enough credits to correspond to the first year of university, which means this organization is a veritable springboard to university access. Another feature of Modern States Education Alliance is these courses are offered without any tuition fees, including books and the material furnished for free online. The organization functions somewhat like a big, public digital library with an international reach. The only thing really essential is an internet connection. No admission criteria are required to follow the courses: no age consideration, location, family income, nationality, level of education, number of credits obtained, or any other factor. The courses really are open to everyone and follow the student’s own rhythm. As such, Jonah shares his story and explains that he was able to complete his university diploma in four years instead of five. But this could also be the opposite, according to the circumstances, since there is really no time constraint to study a course. The majority of Canadian universities credit certain courses according to the results obtained in one of the two tests. It is always a good idea, however, to verify with the university or universities of interest to be sure they accept these tests. Peter Stock, HSLDA Canada President and CCHE Executive Director, recently wrote about an incredible FREE opportunity for post secondary education for homeschool students. While it may sound too good to be true, it is becoming an encouraging reality for many students. From Calculus and Chemistry, to English and Economics – thanks to the generosity of a wealthy philanthropist, ModernStates.org makes this all possible. Upon completing the courses at their own pace, students can write the widely available Advanced Placement (AP) tests in their own town or region. Students with good scores can apply to and enter one of thousands of Canadian and American universities starting in the second year of their preferred program of study. When applying on the basis of AP test scores, students generally do not need to provide a high school diploma as they are essentially applying as transfer students who have already completed a year of university elsewhere. Most homeschooled students, with well-developed independent study habits, have an obvious advantage over their peers in pursuing this option for higher education. Plus saving thousands of dollars in tuition, student housing and textbook costs is a real bonus! To continue reading more of Peter’s article on this subject matter, please click here.